- Wraps primarily support the wrist and knuckles which protects the hand as well as avoid sprains in the wrist. - Having a strong wrap will give you extra cushioning and confidence when hitting hard, avoiding injury to joints and bones in the wrist and hands. - Beginners often hit the bags and pads too hard, and a common side effect of this is sprains in the wrist, which is made up of delicate bones and tendons. Wrapping hands properly will help with this, however when starting out, the focus should be on technique and speed, rather than force. There are a variety of wraps to choose from, but for the best results don't buy wraps that are less than two inches in width. The length of the wrap will vary from 120 inches for someone with a small hand; to 180 inches for boxers with bigger hands. (We have wraps available in the studio as well as on our online store). There are also gel wraps, which are a good option if you are just starting out. 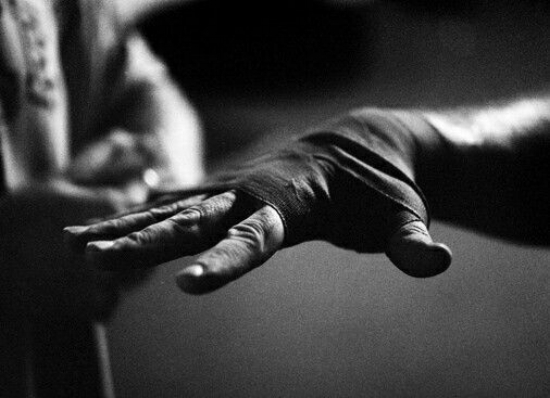 Keep in mind that typical 'Boxercise' inners (like cotton gloves) do not provide any support to the hands and wrist, so it is important to discuss wrap options with our trainers when you come in for your first session. Start off by placing the loop at the end of the wrap over your thumb, and across the back of your hand - this is important so the wrap doesn't slide off when you make a fist. Below is a tutorial video of a basic beginner hand wrap using Everlast 180" wraps available in studio. Nick demonstrates simply how it is done.